January 17, 2019, marked PUC’s annual Martin Luther King, Jr. Colloquy, a time when students and staff alike are encouraged to reflect on King’s influence on both the American conscience and in their own lives. President Cushman opened with an apt quote by King, saying, “Darkness cannot drive out darkness; only light can do that. Hate cannot drive out hate; only love can do that.” He then went on to explain this year’s colloquy would be slightly different than previous years, in that the discussion regarding King’s legacy would be expanded to celebrate the ways in which his life and teachings have impacted all students and faculty at PUC. The audience was treated to the college’s gospel choir’s vibrant performance of “Faithful is our God” before Tammy McGuire of the department of communication took to the stage to introduce the day’s speakers. 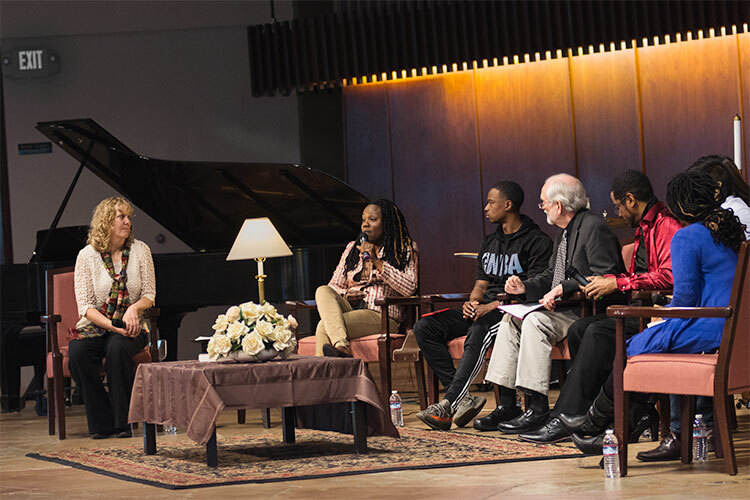 A discussion panel of seven professors, faculty, and students were invited to join McGuire at the front and take part in explaining how King had impacted their own lives and experiences. Included in the panel was Sharon Mapes, associate vice president of finance, Joseph Scott, psychology major, Greg Schneider, professor of psychology and social work, James Cephas, professor of psychology and social work, Michelle Rai, professor of communications, Juan Hidalgo, dean of Newton Hall, and Beverly Glover, nurse practitioner and former professor of nursing at PUC. When asked what King meant to each member of the panel personally, Mapes spoke up first. McGuire paused before asking the final questions, and she asked students to contemplate their own answers before addressing the panel one last time. Hidalgo was the first to answer: “His message is relevant today because at its core it is the peaceful pursuit of human dignity through the eradication of dogmatic ignorance.” He went on to explain on a recent trip to South Africa he was confronted with racism on a scale he had never previously experienced. As a result, he felt regardless of whether we see racism on a daily basis, we must remain committed to awareness and continue to move forward in creating a world where it no longer exists. As the discussion came to a close, McGuire motioned towards the audience and asked students to take a minute to contemplate the questions asked and share their thoughts with the person sitting beside them. After the brief discussion period, she encouraged students to write down the most impactful statement of the day on a slip of paper to be displayed in the Dining Commons later this week. “We want to hear your voices, and we want to know how Dr. King’s influence has inspired the PUC family,” McGuire explained.